The Sofia Bros. website lists this building along with two others as current (2010) warehouse locations. The others are 475 Amsterdam Ave. and 4396 Broadway. The building at 139-141 Franklin St. is a 10-story brick and stone warehouse and office building constructed by Strohmeyer & Arpe Co. for its own use in 1909. Their sign in copper letters appears over the entrance. (For this sign see the Strohmeyer & Arpe page.) Strohmeyer & Arpe occupied the building from 1909 to 1967/68. Sofia Bros. moved in around 1968. The building at 475 Amsterdam Ave. is an 11-story fireproof warehouse constructed in 1922. The original owners were the Metropolitan Fireproof Storage Warehouse Corp. Their M is found among the decorative detail on the front facade (click for detail). Sofia puchased the property in 1950: "Sofia Brothers interests have added another warehouse to their holdings through the purchase of the eleven-story building at 471-475 Amsterdam Avenue, occupied by the Metropolitan Fireproof Warehouse... The building, constructed in 1925, fronts seventy-four feet on Amsterdam Avenue and Eighty-third Streets. In addition to warehouse space, the building contains exhibition and sales rooms and other facilities. 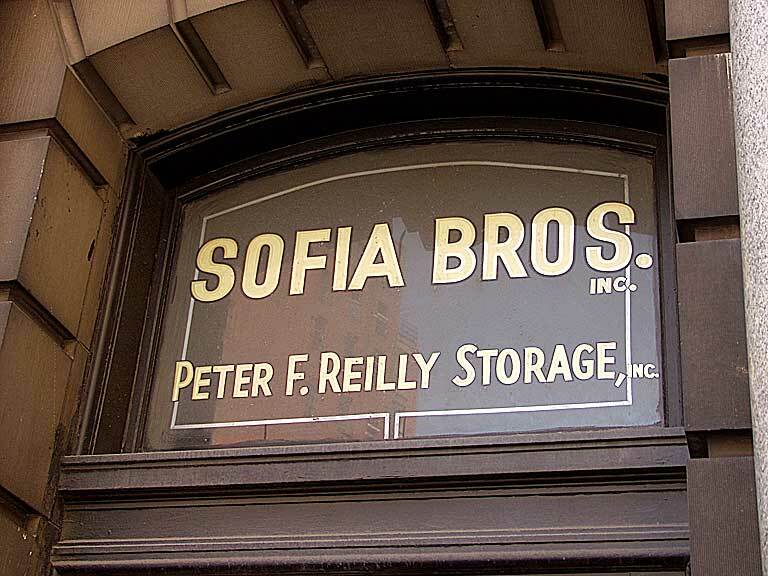 Sofia Brothers, established forty years ago, have three other warehouses in the city." (New York Times, 5 Dec. 1950, p. 55). The building at 4596 Broadway is a 7-story brick storage building. It was built by the Sofia Bros., themselves, Theodore Sofia, pres., in 1928. The cost estimated when plans were filed with the New York City Dept. of Buildings was $100,000. But the origins of Sofia Bros. were in the Bronx. In 1900 Theodore Sofia and his wife, Theresa Sofia, lived at 1221 Intervale Ave., the Bronx. They were immigrants from Italy (Theodore in 1879 and Theresa in 1883), and they had eight children ranging in age from 15 years to 4 months, all born in New York. Theodore worked as a street sweeper for the New York City Dept. of Public Works. By 1910 Theodore Sofia had died, and his widow, Theresa Sofia, still lived at 1221 Intervale Ave. The family maintained a boarding and livery stable at this address. This stable was the origin of the Sofia Bros. moving and storage business. The brothers in the business were Charles Anthony Sofia (1885-1962), Frank Sofia (1886-1937), Patrick Sofia (1890-1966), James John Sofia (1892-? ), Theodore Charles Sofia (1895-1955), and John Sofia (1899-1985). Mater Familias was Theresa Sofia (1857-1941). In the 1910 U. S. Census all of the boys were working in the stable except John, who was only 10 years old. The stable at 1221 Intervale Ave. was listed in Trow's New York City Directory from 1910 to 1915 as the Intervale Boarding & Livery Stable. In 1915 it was also listed as the Intervale Express Co.. Then in 1916 Sofia Bros. was listed at the same address as "blacksmiths." In 1917 four of the brothers registered for the World War I draft. Frank Sofia registered as "stable manager Sofia Bros." and Patrick Sofia registered as "stable superintendent Sofia Bros." This indicates that by this time, although they still thought of themselves as operating a livery stable, the name had changed to Sofia Bros. In 1918 John Sofia registered for the draft and gave his occupation as "chauffeur Sofia Bros. Van." The first listing in the New York telephone directory for Sofia was in 1920: "Sofia Bros storage 1221 Intervale Av INTrvale-1927." In Jan. 1921 "federal prohibition agents seized 60,000 bottles of 5 per cent. beer, packed in 500 sugar barrels, after they had been transferred from cars in the Van Nest yards of the New Haven Railroad to the warehouse of Sofia Brothers at 1,221 Intervale Avenue, the Bronx... Theodore Sofia, a part owner of the warehouse, and Joseph Kramer, a chauffeur ... were arrested." In 1941 on the death of Theresa Sofia, the following notice appeared in the New York Times, "Mrs. Theresa Sofia, widow of Theodore Sofia and mother of the five owners of Sofia Brothers, Inc., moving and storage firm, died in her sleep Saturday in the house at 1235 Intervale Avenue, the Bronx, which had been her home for sixty-five years. Mrs. Sofia, who was 81 years old, leaves two daughters, Mrs. Harry Newenhoff and Mrs. Anna Girolamo, and five sons, Charles A., John, Theodore, Patrick and James Sofia." In 1955 on the death of Theodore C. Sofia, the following notice appeared in the New York Times, "Theodore C. Sofia of 1 Kent Road [Scarsdale, N.Y.], the president of the New York moving and warehouse firm of Sofia Brothers, Inc., died here today in Lawrence Hospital at the age of 60. With his brother, John J. Sofia, he started the business forty-four years ago. It owns three warehouses in New York." This advertisement for the Sofia Bros. appeared in the Manhattan White Pages, 1925. Almost fifty years later this one appeared in the Manhattan Yellow Pages, 1971. From the mid-1940s until the early 1980s Sofia Bros. occupied the landmark building at 41-47 Columbus Ave. (corner of 61st St.). This was built in 1929 as the Kent Automatic Parking Garage, and is described as follows in Guide to New York City Landmarks, 4th edition, by Andrew Dolkart & Matthew A. Postal, 2009, page 132, "(Jardine, Hill & Murdock, 1929-30)… This flamboyant brick and ploychrome terra-cotta Art Deco building was erected as a parking garage that employed a patented automatic parking system: an electrical "parking machine" engaged each car by its rear axle and towed it from an elevator to a parking spot. Unfortunately, the novel system failed. The building served as a more conventional garage until 1941, when it became the Sofia Brothers Warehouse. In 1983-84 the warehouse was converted into luxury apartments." Alan Lapidus, Everything By Design, 2007, p. 259, has an account of using this building for office space in the 1970s, "Mr. Sofia did indeed have a space to rent... He delighted in telling me the history of this beautiful building. It's a great New York saga: The structure had originally been built during the late 1920s as the first high-rise, fully automated garage in the world. Cars entered and were moved automatically via steel rails to a large elevator that delivered them to a preset floor where they were again moved to an assigned space. All this was done without human interaction." Alan Lapidus is the son of Morris Lapidus (1902-2001), who designed store fronts for the A. S. Beck Shoe Stores. Peter F. Reilly Storage, Inc. When Peter F. Reilly died in 1936 the New York Times, 20 Jan. 1936, carried the following obituary notice, "Peter F. Reilly, an originator of the enclosed moving van and proprietor of Peter F. Reilly Monmouth Storage and Warehouse of Brooklyn, died Saturday at his home, 538 Carlton Avenue, Brooklyn. He was 72 years old. The business was started by his father in 1860 and is now carried on by a son, P. Frank Jr."
Peter F. Reilly (1863-1936) appeared in both the 1870 and 1880 U. S. Census reports, living with father and mother in Brooklyn. His father, also Peter F. Reilly, was 40 in 1870 and 50 in 1880. He was born in Ireland, and his occupation in both instances was "truckman." The younger Peter F. Reilly was 8 years old in 1870 and 17 in 1880. In 1880 he was a truckman, like his father. Peter F. Reilly (the second) also appeared in the four successive U. S. Census reports from 1900 to 1930. Over the course of these 30 years he lived at 538 Carlton Ave., Brooklyn. In 1900 he was 37 years old, born New York, May, 1863. He had been married 15 years. His wife, Augusta, also 37 years old, was the mother of 8 children, of whom 5 were living. Among the children was their son, Frank, age 11. In 1910 Frank was called Peter F., now age 21. Frank/Peter Jr. was the P. Frank Jr. mentioned in Reilly's obituary. (Apparently the F. in Peter F. Reilly stood for Frank.) In 1930 Reilly's son was a widower living with his father. He was 40 years old and named P. Francis. This ad for Peter F. Reilly appeared in the Brooklyn Daily Eagle Almanac, 1900. At that time the business was located at 614-622 Dean St., Brooklyn. By the time of this ad from the 1929 Brooklyn telephone directory Peter F. Reilly's Sons had built a new facility on Bergen St. near Flatbush Ave. As of June 2011 the warehouse at 491-495 Bergen St., Brooklyn, still functioned as the home of Peter F. Reilly Storage Inc. The Sofia and Reilly moving and storage companies seem to have merged in the 1980s.